What is the lesion like? What are the MRI signal characteristics? What is the differential diagnosis of paranasal sinus tumour? ‹ PreviousDr. Pepe Case 140 – Art of interpretation – SOLVED! Illdefined soft tissue density is seen at the left nasal cavity, left ethmoidal air cells with intracranial extension. 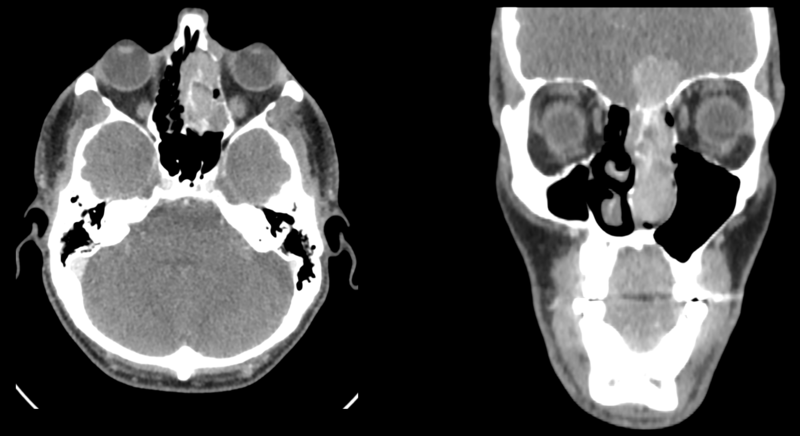 the lesion shows inhomogeneous enhancement at post contrast CT image. it displays mixed predominatly high T2 signal, low signal at T1 image and inhomogeneous enhancement at post contrast image. the lesion likely neoplastic in nature ?malignant , ?adenocarcinoma ?? meningioma. where,what: lesion is involving left ethamoidal air cells , nasal meatus on left side and extending into extra dural space . extension across nasal septum seen. lesion appears solid enhancing and aggressive. MRI:Hypo on T1 ,hyper on T2 with enhancement on post gado. D/D: SCC of paranasal sinuses ,sinonasal carcinoma, olfactory neuroblastoma, lymphoma, polfactory neuroepithelioma.